A couple of weeks ago I had a dream unlike many I've ever had. Most of my dreams tend to be about something that is scary. Breakfast, 30" x 12" x 1", acrylic on canvas. This dream was about food. Not a specific meal but about all meals, generally. I was seeing images of breakfast, lunch and dinner. Now I didn't go to bed hungry and wasn't watching a food show on the T.V. 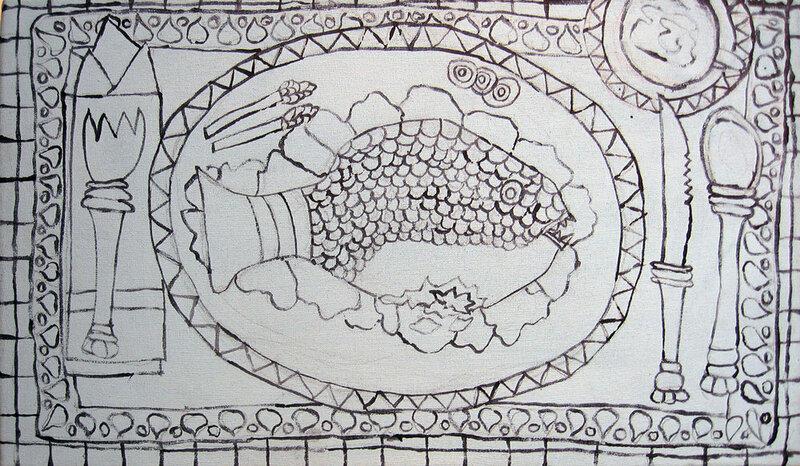 I did a drawing some months ago called Fish Plate that I see every day hanging on the wall in my studio. Maybe it peaked my subconscious. Fish Plate, 9"x 12". Acrylic and ink on watercolor paper. Most of my work is about fantasy worlds that depict life situations that relate to our own world. This was sparking something in me, I decided to start a small series of paintings while I do my other work. I then set out and drew up 3 canvases, breakfast, lunch and dinner. You can see all the rough canvas drawings here and the one I just finished, "Breakfast." Fun to do and my vibrant colors are very evident. Will post lunch and dinner when they are done. Who knows after these I might get into all different types of food and open a restaurant serving finished paintings. If you are interested in purchasing any of these works or something else on my website please contact me. Breakfast as seen from the right. Breakfast as seen from the left.